Uzu Sanageyama is the Athletic Committee Chair. In addition to his 3-Star Ultima Uniform, Uzu has the power of the Heaven's Eye, which allows him to predict the behavior of his enemies just by observing the movement of their muscles, their breath and other simple reactions. He fights with a shinai, a bamboo training sword. He challenges Ryuko to a duel and subsequently lost because of his overdependence on his Heaven's Eye, losing his rank as one of the Four Devas. Because of that humiliation, he has his eyes sewn shut, removing his eyesight altogether, including the Heaven's Eye. He asks Satsuki for a second chance and reinstatement into the Four Devas, who after seeing his determination, approves. 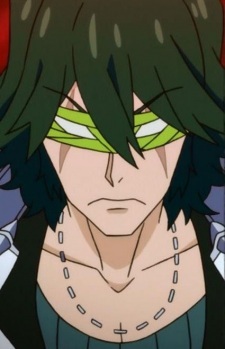 With his eyesight gone, Uzu's other four senses heighten to the point of manifesting the superior Mind's Eye, and he manages to overpower and cause Ryuko to retreat in their rematch.